Our country’s critics are obsessed with defining Canadian culture. This endless practice has created a cultural taxonomy within Canada, more closely aligned with biology than art. If anything, it reminds me of the work of American scientist Stephen Jay Gould, who references Darwin’s scientific taxonomy, re-establishing the terms lumpers and splitters. The latter group, he theorizes, are people who see varied categories, and their corresponding connections. Those belonging to the former group, in contrast, see the same category, with only minute difference. There is no moral judgment in Gould’s categories; it’s science. Not so with culture writing—nor the conversation around who and what can be thought of as truly Canadian. We infinitely split culture, while simultaneously pretending a nationalist identity can exist under a single umbrella. (Be it beavers, poutine, or multi-culturalism.) We ask: has such-and-such artist sold out? Have they become too American? Are they too recent a newcomer? Do they have deeper loyalty to their cities, or their provinces, or small towns than the nebulous idea of a nation state? Or, we address the splitting in more complicated ways: Are Québécois Canadian? Are Indigenous peoples? The answer to these questions, if critics are not careful, assumes that Canadian culture is synonymous with an Anglophone white urban university-educated population. Such issues become even clearer when the nominations for national prizes are rolled out. Take the Polaris. When one awards a cash prize, and some amount of social cachet, for “the best full-length Canadian album based on artistic merit, regardless of genre, sales, or record label,” the splitters can have a field day working through problems of definition. How do we define what a Canadian album is? How long is a full-length album? What about something like Drake’s playlist—is that an album? What about an EP? How do we define artistic merit? How do we rate hip-hop against classical; jazz against metal? Some more cynical questions can also arise: does an artist with more of a marketing budget get more of a chance with the Polaris? Does someone from Toronto have more luck than someone from rural Alberta? Does someone who has done most of their work in the States or with American writers or producers count? Steve Jordan, founder of the Polaris, believes strongly that the best work is being offered. But, the prize is chosen by critics—a dying breed, and one that sustains itself in tight circles. These circles reflect the bias of how we understand music in Canada, in general. And certain genres of music suffer more heavily under this bias. Critics do not, for instance, listen, as a general rule, to country radio. No producer, or even on-air talent, from Country Music Television Canada is on the jury, nor from major commercial country stations in Hamilton, Calgary or Edmonton. Country music in Canada is popular enough, with a well-established infrastructure, and a strong national history. But it is not taken seriously as an aesthetic force. In cultural circles, it’s consistently snubbed. And for this reason, it provides a perfect example for how to rest taxonomy on the Polaris, and perhaps by extension Canadian culture in itself. In Canada, you can get the indie respect of Toronto or Montreal critics, who will let you on the CBC and let you win the Polaris, or you can get the respect and sales of middle Canada. Part of this is class—the idea that working class representations are still under-considered, and thereby under-represented in this country. Pop country is still unfashionable. The effort it takes to read the history and aesthetics of it has much less cultural capital than the effort it takes to read the grammar of Drake. Plus, too often for Canadian artists and critics, success equals American recognition—being hip in Brooklyn or Austin means something, but having modest goals of bourgeois Canadian success means much less. This lack of understanding may also reflect a general embarrassment, or a concern about being backwards or a rube. No Canadian country act has won the Polaris. Depending on if you define folk-rock as a kind of country, the Sadies (in 2010) and Kathleen Edwards (in 2008 and 2012) are the only country-adjacent artists to even make the short lists. There’s also Daniel Romano, who reworks pop as a kind of ironic pastiche, playing at being a drug store cowboy, in such a way that he has separated himself from anything resembling country. He has been rewarded a long list place in 2011 and 2013. Only one unarguable country singer, Corb Lund, the Albertan cowboy singer, has been nominated for the long list, for his album Cabin Fever, in 2013 and for his equine conceptual album, Horse Soldier! Horse Soldier! in 2008. Lund is smart, an excellent performer, and a strong regionalist. His sings about the local world of rodeo, farming, and oil rigging, but also about the heartbreak that happens when lovers move to Montreal, or about the possible end of the world. His voice is a loping baritone. There is very little that is not Canadian about him. He is a critic’s favourite east of Manitoba, and a beloved local figure west of it—selling out major Stampede events. His nostalgia, and his willingness to play up being a cowboy for Eastern audiences, becomes a performative way of rewarding authenticity, regardless of obvious talent. Lund’s singing mourns for lost ranches, allowing his audience to yearn for a past of which they may never have been a part. When Lund’s albums push hard on historic nostalgia, they are rewarded. But the opposite is also true. Last year’s Things That Cannot Be Undone addresses soldiers in Afghanistan, dying ranches, and current malaise, and was consequently snubbed by both the Polaris and the Junos. It dropped the mask, became less performative, and was left to wilt. In other words, Lund became too real. It’s a fine line. Country records stand a better chance of earning a critic’s nod if they can sound like indie rock, or if they can flirt with genre without becoming too authentic. This taste of—acceptable—modernity helps explain the love of the Sadies, Strumbellas, or Blackie and the Rodeo Kings (none of which I would argue are country). Such albums are thought of as ironic or performative, or at least writerly; they pay attention to a winking formalism and are thus praised. This cultural splitting helps explain why roots rockers spend more time with Neil Young, who has only ever been tangentially country, and less time with people such as Wilf Carter or Hank Snow. And it also helps explain why Young would get the Polaris Heritage Prize, before Anne Murray, or why k.d. lang would be nominated for her work as a jazz chanteuse and not for her work with Patsy Cline’s producer. Some categories and sub-categories and even sub-sub-categories are deemed worthy, but others are not. Even then, critics make some curious choices in cultural taxonomy. In theory, the 2017 eponymous release from Colter Wall (the son of Saskatchewan premier Brad Wall) should have made the long list. The album is one of the most lauded, profoundly adored albums of the year. Pitchfork, which rarely writes about country, but often writes about Americana, gave it an eight out of ten. Rolling Stone debuted the single. Lund has bona fides for being an actual cowboy, and his authenticity is laced with a knowing irony. Regardless of what one thinks of Lund’s hat act, he can actually ride, and his family has been riding for decades. This is not the case for Wall, which suggests that eastern critics continue to fail to absorb the language, history, or tradition of country. In this case, authenticity is divorced from talent, but connects to a network of marketing, a set of aesthetic signposts. A country album can be good and authentic (and I think that Horse Solider! Horse Solider! deserved the Polaris the year it was nominated), but it can also be bad and appear as authentic, (like Wall) or good and inauthentic, falling outside of how we narrowly define authenticity. Too often, and to our detriment, we think of authentic as a kind of pure act of creation, refusing to consider it as an aesthetic category—one that has a moral weight, or even an arch performativity. 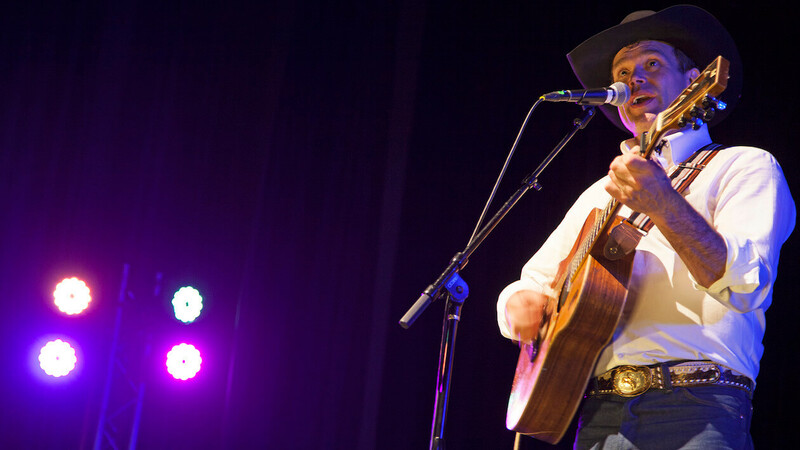 Corb Lund is rewarded with the long list when he performs the singing cowboy well. Colt Wall is thought to be a good cowboy singer because he sounds like Van Zandt, who is the zenith of “authentic aesthetic.” But there’s also Dean Brody, one of the best-selling artists in Canadian country music. While he gets regular play on both country radio and country television, Brody hardly gets any notice from critics at all. That’s likely because he falls too far outside the established—and contrived—zone of authenticity. His country authenticity is too debatable: his production could be called too slick, or too adventurous, or too willing to play with genre. To have a conversation about the importance of artists like Dean Brody, however, we’d need critics who could widen the taxonomy of good country music—critics who would consider lumping instead of splitting. Brody, after all, is easy to listen to. He’s a British Columbia man, who is not afraid of admitting to smoking dope. He often sings about daily pleasures. His work has a casual ease that betrays both incredible skill and committed effort. He is one of the finest storytellers in the business and is able to carry a narrative through both ambivalence and profound complications. For instance, his song “Bounty,” with Lindi Ortega, is an updated murder ballad about fleeing to Mexico. Its themes of redemption and moral consequence make it one of the deeper attempts in revitalizing the genre. Sometimes he gets genuinely weird. A ballad about marital love can turn into a reggae tilted effort about the love of God; he has recorded an epic song about good ol’ boys in trucks being abducted by aliens. He has also written one of the greatest songs about being a Canadian, and what that identity entails. That song is “Mountain Man” and it is one of the most adept depictions of conflicted, camp, Canadian identity—across any genre of music, or sub-genre of country, for that matter. In it, Brody lampoons city dwellers and suburban folks who pretend to know nature. He also makes fun of his own masculinity, refusing the cult of butch theatrics that Americana artists commit to. But it is light and it refuses to take itself seriously, which, unfortunately, also suggests that critics won’t take it as seriously as the Juno voters—who also might contain industry vets, radio programmers, or fellow musicians. But maybe critics should also matter less. With country, at least, their ceaseless splitting hasn’t helped us much. Wall is taken seriously by the critics, but sells poorly. Brody has won two Junos, is a regular feature at Canada’s Country Music week, and sweeps up the genre awards. Even his presence on Canadian radio seems to come from general affection as much as CanCon regulation. But to vaulted music critics, he’s a nobody. I doubt he’ll ever be part of the Polaris conversation, whereas it’s easy to imagine Wall will get a Polaris nod—if not a short list, at least a long list, and fairly soon, too. He has a willingness to play to critics who have a limited understanding of the country genre. Brody does not. It might be that, in Canada, country music is stuck in a land of splitters: between Americana and pop country, between authentic and inauthentic, between east and west, between this and that. The split plays out in both commercial success and critical praise. When it comes to the Polaris, judges are supposed to vote against these splits—condense them into a singular best album. I’d argue that they don’t, however, considering who gets nominated, the lack of surprise in the nominations, and the repetition of similar artists and producers, who gets traction, and who fails to get noticed. Ignoring Brody, then, becomes a metonymy for the larger neglect of a genre, of treating that genre as an act of historic nostalgia, of overlooking the influence of American producers. And, Brody is a white man. Many other country singers face additional barriers and are similarly at the mercy of the splitters: singers who are women (we have avoided talking about Whitney Rose or Lindi Ortega, both major country talents, or discussing what exactly happens when Shania drops long awaited music next year); who are Indigenous (there is a decades long tradition of country gospel North of the 60, which we ignore); who are Francophone (Quebecois country is legendary); and so on. It seems telling that country music’s hope is a prairie kid from a privileged family who bought an American producer to convince Eastern Canadians that he should be lauded for being a real live cowboy. It’s just a shame he isn’t better at it. Country music has a chance at being the music that best represents our country—and has already done so for a very long time, not just in rodeos and Stampedes, but in kitchen parties in Newfoundland, honky-tonks in working-class Francophone Montreal, barn dances in the southern Ontario countryside, and throughout the Arctic. Putting an end to our constant cultural taxonomy will not only make us better listeners, it will make us more complicated Canadians. And that’s a good thing.